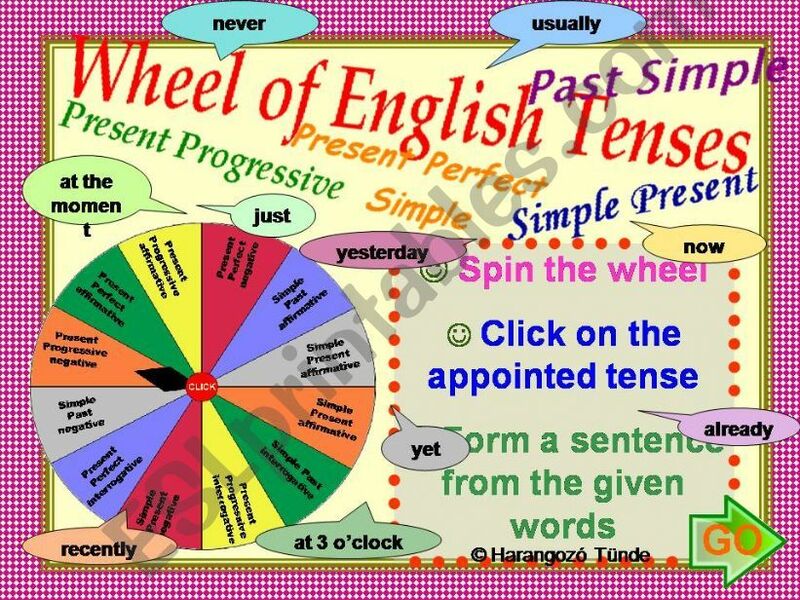 Wheel-game about sentence formation in four basic tenses (Pres Simple, Pres Cont, Present Perf Simple, past Simple)Spin the wheel, form a sentence from the given words in the appointed verb tense (also prescribed affirmative, negative or interrogative). Check yourself with the solution and spin the wheel again. Altogether 36 sentences. Have fun!! How clever, interesting and useful, many thanks for sharing. Wonderful! I love it. Tks! Thank you very much. it´s really helpful! Fantastic game! Thank you very much! Great as usual!Thanks a lot! Well thought out and entertaining. Thank you. It is great! Unfortunately the wheel doesn´t spin as the pointer does. Regardless, I will use it for one of my classes when I have 5 or 10 minutes left before the class ends. Thanks! Excellent and very useful. Thanks a lot!!! Thank you very much for this wonderful game! Nice work! !Thanks a lot for sahring. Thank you so much! It´s very creative! Caps down for this one! :-) Thank you! Another marvelous game for advanced students.. Thanks for sharing! Great PPT. Thanks a lot. A very nice and useful ppt,thanks a lot! Thanks for sharing such a fantastic job!Have a great week! Superb!!! Haven´t seen a better PPT :) Thanx a million for an excellent effort! Great .Thank you very much. I can´t stop admiring your work! My Students loved it! Congratulations for this marvellous work! thanks, this is very interestig! Excellent! Very creative ! Thanks for sharing ! I´d like to download this powerpoint but i have no contribution. Can someone help me plz!?! Thanks very much .It´s amazing.